I should start with congratulations to Kayla for keeping her energy up through the evening after having just completed a grueling 41 show run with the recent Champions of Magic tour! Hurray for Loblaws, Roots, and Canada Canadian Tire! And beer, ginger beer, and Brio! Colour changing bottle caps are very cool. Staff appreciation and lessons from street performers. If you aren't already, subscribe to Shezam, the feminist podcast that hopes to make itself obsolete. The podcast has great tips and strategies for young women starting out in magic (No pockets? No problems!) Carisa Hendrix and Kayla also share entertaining anecdotes about performing and lots of pro-tips too! After the break, Kayla gave a fabulous hands-on lesson for colour changing bottle caps using a technique even I can master! Good times, good fun, good magic. The Champions of Magic did 41 shows in 17 days in Toronto this holiday season! Well done! Random thoughts on "Chris Westfall Magic & the Porcelain Princess"
Last night I had the pleasure of catching "Chris Westfall Magic & the Porcelain Princess" at the Papermill Theatre (part of Todmorden Mills on Pottery Road, tucked in next to the DVP). It's a cozy theatre that seats approximately 150. I'm guessing there's not a bad seat in the house. If you ask me what my favourite part is, my answer would be "the beginning to the end." If I were half as good a magician as Chris Westfall, I'd call myself incredible! Ben Train kept the kids captivated in the lobby while we waited for things to get started. Chris made the kids laugh as he gave the audience a pre-show sneak peak at Bella. From the beginning, Chris and Bella, deliver a very visual and high-energy show! Bella elegantly defied the laws of physics with, among other things, a crystal ball, rings, and a hula hoop. Chris masterfully executed illusions large and small. Mouth shuffling was unexpectedly entertaining! A Pokéman Go player made a timely and unexpected cameo. This is a volunteer intensive show. By my count there were eight delightful children and one good-natured adult brought up on stage. The volunteers were fabulous, and made the evening so much fun for everyone! Chris expertly engaged the children, and had them eating out of the palm of his hand (figuratively). Hang out after the show for post-show photos, autographs, and a meet & greet! "Is it magic, or is it illusion?" 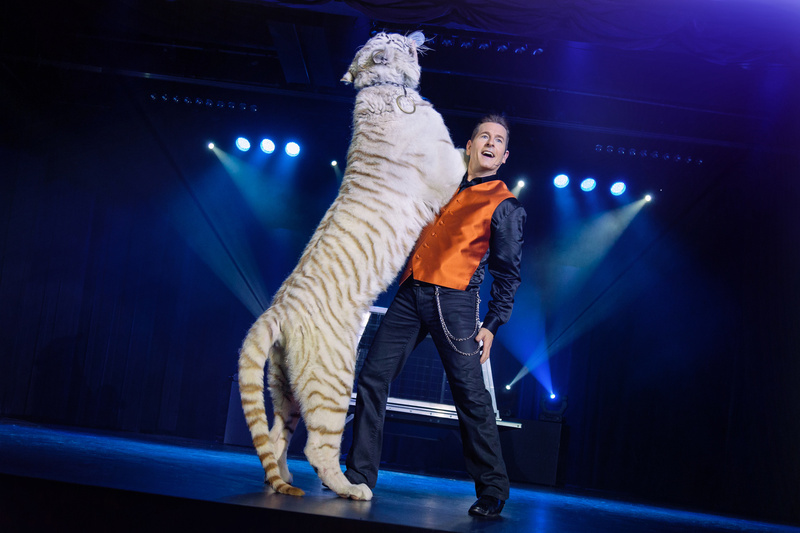 To learn more about this family friendly show, visit Chris Westfall Magic. You can purchase tickets for tonight's show (Friday July 22) at Eventbrite. Disclosure: My family and I were guests at this show. The opinions expressed above are entirely my own. I did not receive compensation for the writing or the publishing of this article. Random thoughts on Greg Frewin's "Wild Magic"
Greg's appearance at this year's Browser's Magic Bash whet my interest enough that earlier this month we made the trek back to Niagara Falls. Our schedules didn't allow us to make a day of Niagara Falls. We consulted with Google to find out how long the trek might take, and added an additional 30 minutes to the longest estimated time in an attempt to get us to the theatre by 7pm. If traffic was good, as it should be in nice weather, we'd be in town early enough to take a walk by the Falls and see a sight or two. Apparently, because of the nice weather, everyone was out in their car on our path to the theatre. In spite of using all the HOV lanes available to us, traffic did not cooperate. We arrived in the parking lot at 7:22pm, for a 7:30pm show. (Thank goodness for a spacious parking lot!) I was frazzled and desperately had to use the bathroom. Note to parents: If you can organize yourselves better than we did and get to the theatre with time to spare, there's a nice photo opportunity for your little ones next to lion statues by the front doors. We piled into the building and the lovely staff at the box office had our tickets waiting for us, calmly showed us to the restrooms, and then showed us to our booth. We were no sooner seated when the lights went down and the show started. There's a smattering of mentalism, juggling, and close-up magic to keep things varied, but make no mistake, Greg's large illusions dominate the show! There were three large video screens making it easy to see the close-up parts from any seat in the house. The show was different enough from the last time we were there, that it felt new to us. It made me happy that some of my favourites from last time (like the one with water and fire) are still in the show. A good pair of theatre binoculars gives you a seat upgrade, no matter where you go! Some of the illusions from 2012 are still in the show, but with very different presentations. It's fun to see how things get reimagined and repurposed! I was delighted to learn that Boomer, the Siberian tiger who battled cancer, was back in the show. The show is fabulously entertaining! The show is just the tip of the iceberg. After the show we queued up to have our photo taken with tiger Cashmere. Even though KOP and I were hamming it up for the camera by looking scared, there was nothing scary about the experience. The tiger trainer is right there keeping a careful watch at all times. Part of the profits from the items in the magical gift shop, including the photo sales, are used to support a tiger sanctuary. We had our photo taken with Greg in front of one of the show props. We learned lots about tigers, spent some time with Rocky, and watched some video of Greg's tigers. The group of us got to stand on the stage and watch his blue macaw in action! We were lucky and got to pet her! Have a look at a more recent photo of Shira! Shira was drinking from a baby bottle the whole time, and the staff were lovingly and patiently wiping up anything that spilled. Hats off to tiger trainer John Ferrara and to all of Greg's animal handlers. They clearly love the animals and love what they do! Greg entertained a wide variety of questions from the group. Dare I say it? The post-show experience is almost as exciting as the show itself. We had an incredible evening! Thank you to Alex, Kaitlin, Terry, John, Cooper, and everyone else involved in making it such a magical evening for my family. A special thank you to Greg, for his hospitality and for sharing his magical talent! Last but not least, thank you to the lovely people who gave me this purrfect gift! Random thoughts on "Outerbridge Clockwork Mysteries"
I recently had the pleasure of seeing Marion and Ted Outerbridge perform their show "Clockwork Mysteries" last month. They had just completed a 5,500 mile US lecture tour. I caught them at the Milton Centre for the Arts. A fast paced, extremely entertaining, high-energy show. All illusions, big and small, were masterfully performed. Greta the Psychic Goose earns her keep. There is a nice ratio of grand illusion, intimate magic, and mentalism. I really enjoy watching "assistants" do magic in their own right. Marion owns it! Those of you who know me well, know that my opinion of magicians is heavily weighted on how they treat their audience members. One of my favourite moments in the show, lasted no more than 2 seconds. Ted walked into the audience to select a volunteer. He found someone he wanted to bring on stage. She said, "no." Instead of cajoling or otherwise pressuring her, he simply moved on and found someone else. That's how you make the audience feel like you can be trusted to treat them right. Show people respect from the get go. Ted has a knack for picking awesome audience volunteers. Six year old Archer was a really good sport and owned that stage! Nine year olds can't be trusted to count down from 90. Ted's disco ball jacket is a thing of sheer beauty! I love that audiences in 2016, still enjoy watching someone get sawed in half, into halves, into two pieces. Among other wonderful pieces, we were treated to: "The Psychic is Right," "The Time Machine," "Alarm Clock," "Floating Barricade Light," "Outside of the Box," and their elegantly performed "Levitation." The biggest mystery of the night for me: How does Marion manage all of those costume changes? If you get a chance to see them perform their show "Clockwork Mysteries," go and see it! To learn more about this fabulous duo, listen to the Scott Wells' podcast 278: The Inner Secrets of the Outerbridges or visit their website at www.outerbridgemagic.com. [Guest post] Report on "Morton the Magician and his Magnificent Magic Show"
I was generously provided a copy of "Morton the Magician and his Magnificent Magic Show." This book, which was shortlisted for an Alberta Children’s Literature Award, is intended for young readers. With that in mind, I found a youthful reader who agreed to read and give me their feedback on the book. My thoughts on Sheldon Casavant's book "Morton the Magician and his Magnificent Magic Show." This is a good picture book for parents to read to their kids. I really like the drawings, they're very nice. Morton is someone that children can relate to. I like that there are two tricks in the book that you can do by yourself. It's funny that the rabbit is the announcer. If I were younger, it would make me want to try doing magic tricks. Parents, if your child under 6 years old likes magic or wants to be a magician, this is the perfect book for them! I like the words in the air before Morton's show, letting us know what's going on inside his head. The story tells us we can be anything we want to be if we just put our minds to it. Last night I attended my first magic lecture since moving to Montréal. David Kaplan, also known as The Great Kaplan, shared some tips, tricks, and stunts from his professional repertoire. We don’t get out a whole lot. We used to when we were younger, but now, after a day at the magic shop we are happy to go home and relax. But Asi Wind, New York Mentalist and Mind-Reader, was giving a one man show at the Comedy Nest at the old Montreal Forum and we wanted to see him as we had heard about him of course but never had seen him. Last night I had the pleasure of attending The Uncertainty Project by James Alan. I had spent the day volunteering my time for the benefit of school age children and had already experienced more than my share of excitement and uncertainty. (All's well that ends well, thankfully.) I was a little apprehensive about filling my evening with more uncertainty. I'm glad I did. The audience is a wild card for which it is nearly impossible to be completely prepared. As near as I can tell, no rabbits were harmed in the creation of the show. Any show with links to Heisenberg, Einstein, Fermat, Schrödinger, and Douglas Adams, is cool in my books. I'm not ashamed to admit that I was "one of the two people" who was bothered by claims made on the third piece of glass. I checked. I'm not going to tell you what I discovered. Sometimes it's a good thing that magicians are tall. Crowdsourcing seems to be a surprisingly effective way to get out of a jam. There were some very powerful moments. The Uncertainty Project continues for two more nights.